Jet Airways (India) Ltd said it would monetize its 49% stake in Jet Privilege Pvt. Ltd, the frequent-flyer loyalty programme subsidiary. News reports suggest the associate company will be valued at ₹ 3,000-4,000 crore. While Jet Airways’ market capitalisation is about ₹ 3,000 crore, after adding its net debt, the airline’s enterprise value would be at ₹ 10,000 crore. That’s just about 0.4 times its consolidated revenue. Jet Privilege, in stark contrast, is being valued at seven times its revenues, by news reports. On Point Loyalty, a global management consulting focused on airline loyalty programmes, had valued Jet Privilege at $1.131 billion, or ₹ 7,336 crore, last year (based on the average rupee exchange rate in November). The relatively lower valuation being discussed by potential buyers and bankers may simply be because of the precarious position of the parent company. Nonetheless, monetizing the Jet Privilege stake could prove to be a good move for Jet considering frequent-flyer programmes (FFPs) command far better valuation multiples than the airline itself. To begin with, FFPs are not exposed to the business cyclicality that airlines are vulnerable to. For instance, currently, higher oil prices and the depreciation of the Indian rupee against the US dollar are resulting in heavy losses for most airlines. FFPs are immune to these worries. According to a 2013 paper from EY, there are three main sources of cash inflows for the loyalty business. One, gross margin on points redeemed, which is the spread between the cost of points and the price for which they are sold to commercial partners (such as banks and credit card companies). Another is the expiration of unused points, which results in no reward and no associated costs. The main cash outflow for loyalty programmes results from the purchase of rewards (free airline tickets or products/services from commercial partners), says EY. As a result, FFPs enjoy high profit margins, have low capex requirement and are strong cash flow generating businesses. It depends on many things. Programmes that are able to enrol more members and incentivise members to fly with their parent airlines make for good value propositions. “Also, the airline’s market position and the strength of the credit card sector in the airline’s home countries are major factors in propelling the success of co-branded credit card placement and other financial partnerships," said On Point Loyalty in a report in November. 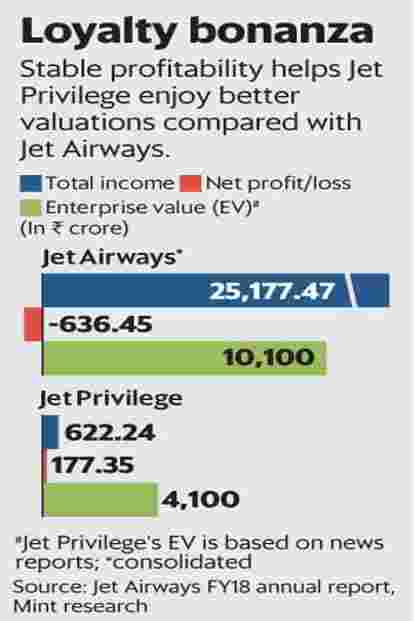 But the above makes it clear why Jet Privilege, were it to be sold, will command a far higher valuation multiple when compared with the airline operations, which are bleeding. Having said that, for an FFP to thrive, its parent airline should be in a far better position than merely survive. It’s little wonder that news reports suggest a Jet Privilege sale will be contingent on fundraising at the parent company as well.